People parked in bike lanes is already one of the established perils of riding a bicycle through NYC. Now a New York cyclist has started a Tumblr for all of you to post photos of NYPD cars parked in bike lanes across the city. 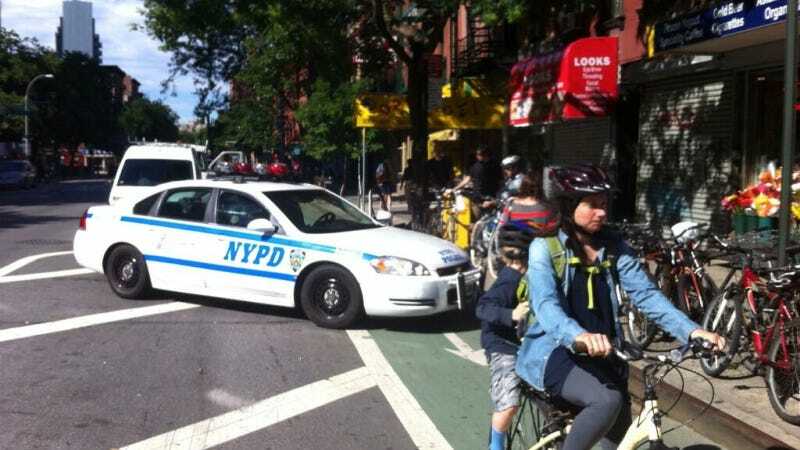 Cops in Bike Lanes is just 2 weeks old but already has several pictures of creative parking choices from the NYPD, which probaly just scratches the surface of law enforcement vehicles forcing cyclists out of bike lanes. "They’re supposed to be there to protect and serve us. And what they do when they’re blocking bike lanes is actively endangering cyclists." It's not just cop cars, after all. A fun little oddity in all of the pictures of police Impalas parked in bike lanes was this Citi Bike Ford Transit Connect that was parked in a bike lane. Oh, irony.